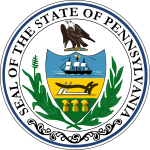 The 1968 United States presidential election in Pennsylvania took place on November 5, 1968, and was part of the 1968 United States presidential election. Voters chose 29 representatives, or electors to the Electoral College, who voted for president and vice president. Pennsylvania voted for the Democratic nominee, Vice President Hubert Humphrey, over the Republican nominee, former Vice President Richard Nixon. Humphrey won Pennsylvania by a margin of 3.57%. A third-party candidate, former Alabama Governor George Wallace, played a significant role by winning 7.97% of the vote. This marked the first election since 1948 that a presidential candidate won the national election without carrying Pennsylvania. That did not happen again until 2000. This was also the first election that a Republican candidate was elected without carrying the state. ^ Although he was born in California and he served as a U.S. Senator from California, in 1968 Richard Nixon’s official state of residence was New York, because he moved there to practice law after his defeat in the 1962 California gubernatorial election. During his first term as president, Nixon re-established his residency in California. Consequently, most reliable reference books list Nixon’s home state as New York in the 1968 election and his home state as California in the 1972 (and 1960) election. ^ David Leip. "1968 Presidential General Election Results – Pennsylvania". Dave Leip’s U.S. Election Atlas. Retrieved 2018-03-25. This page was last edited on 16 March 2019, at 01:52 (UTC).